Description: Longo DVD Copy is a clean and powerful DVD Copy Software. It can copy any copy protected DVDs to computer hard drive or to ISO file, or burn dvds to blank discs. It also can burn DVD from hard drive to blank DVD. Description: Longo Mac DVD Copy is a smart DVD Copy Software for Mac Os. It can copy DVDs to computer hard drive, and also can burn DVDs to blank discs easily.Longo Mac DVD Copy can remove all copy protections of DVDs itself, it doesn't need other decrypters. It copies DVDs very fast, usually finishes copying DVDs in half an hour. And it's very easy to use, the interface is similar with iTunes, so you can easy to manage it. 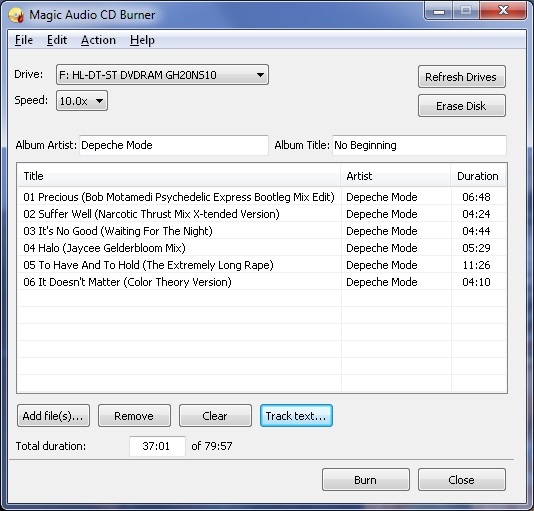 Description: Magic Audio CD Burner is a freeware burning solution for burning MP3, WAV, OGG, AIFF files as CD audio that could be played on car CD player, CD discman, and so on. It allows you to burn aac to CD,ac3 to CD,aiff to CD,ape to CD,flac to CD,m4a to CD,m4b to CD,m4r to CD,mac to CD,mp+ to CD,mp1 to CD,mp2 to CD,mp3 to CD,mp4 to CD,mpc to CD,mpp to CD,ofr to CD,ofs to CD,ogg to CD,spx to CD,tta to CD,wav to CD,wma to CD,wv to CD,3gp to CD,3g2 to CD. Description: Flac2CD is a FLAC + CUE file burner which can burn a music CD from an FLAC + CUE music CD image. A CUE file is required to burn the FLAC file. Features: 1. Works with Windows 95/98/ME/NT/2000/XP/Vista/2003 Server. 2. Works easily with IDE and SCSI drives. 3. Supports use of high write speeds. 4. ASPI not required for NT/2000/XP. 5. Supports use of re-writable CD formats. 6. Supports 11 skins. 7. The upgrade is free for registered users.